After the last two days of snow, all the travel disruption that came with it and an early start, to have 15 Illusions racing on Saturday morning was pretty impressive! That at least four made it down from London yesterday evening and Monty Irwin left his home in Somerset at 05:00 to make it in time for the first race says it all. 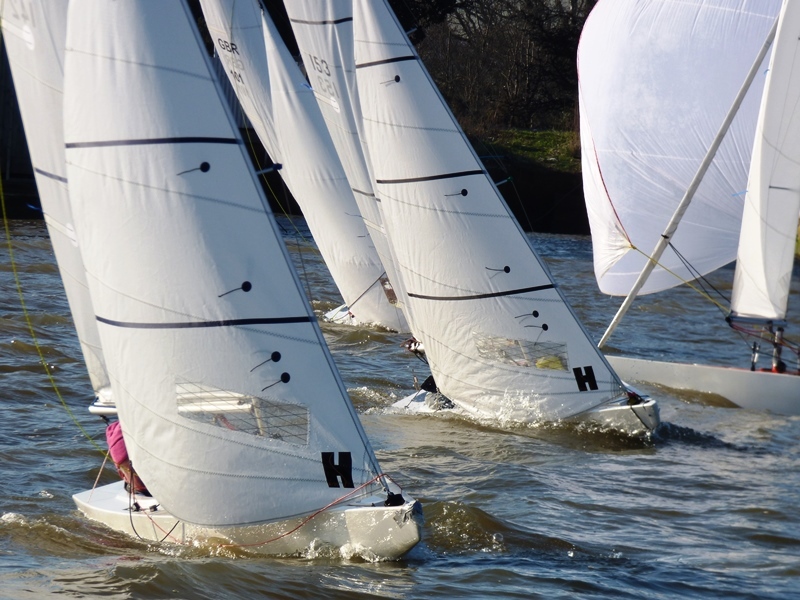 Although conditions were sparkling in an almost cloudless sky, there were some quite dramatic windshifts in the NNW’erly F3 to F5 breeze but after quite a lengthy postponement the start of the first race got away cleanly. Mark Downer was first to round the green spreader mark at the top end of the course; Mike Toogood and Philip Russell were next with Alastair Speare-Cole & Andy Christie not far behind. 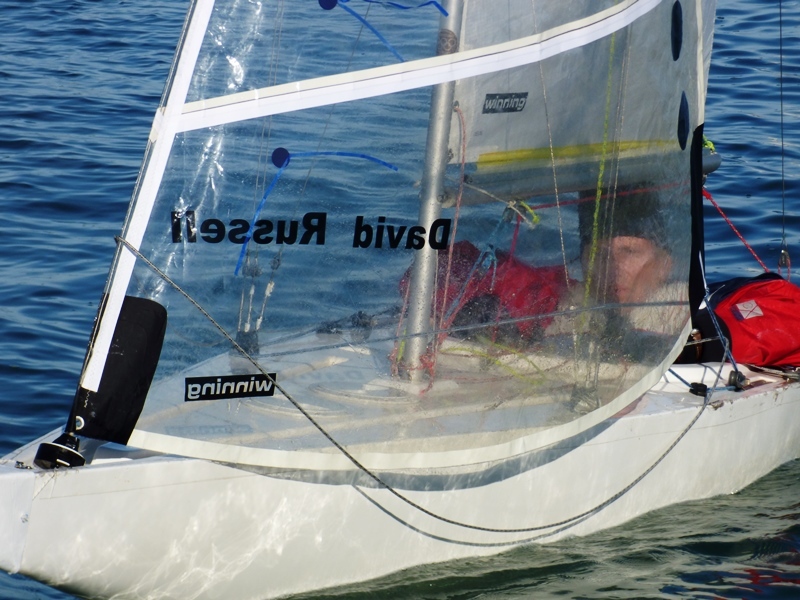 As they were vying for the lay line Bruce Huber and Steve Warren-Smith had a port & starboard situation which the former acknowledged was his fault so he took a penalty. 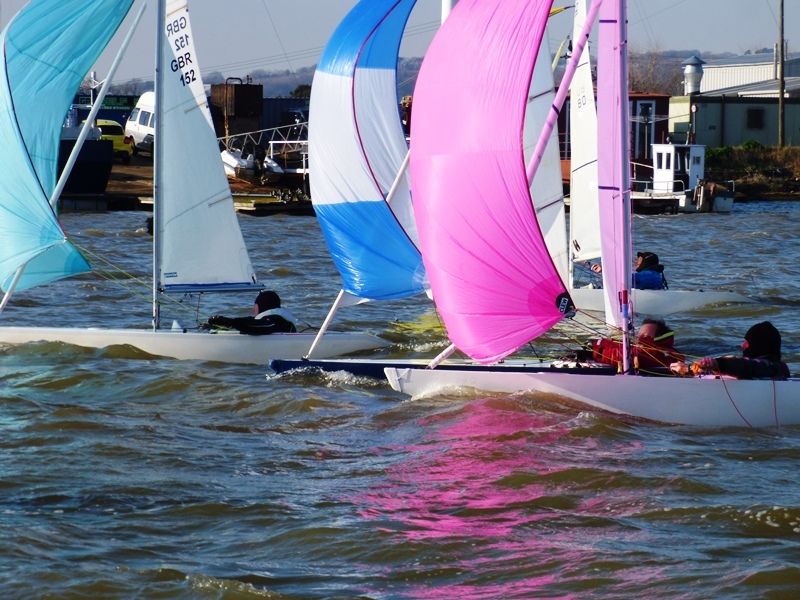 In the second round, Mike T found some extra boat speed and found himself in the lead in front of Mark for a short time but in the end had to make do with second. Philip was a good third and Bruce was fourth. Although they were at the back, well done to newcomers Jamie Scrimgour and Andy Olding who successfully got round the course. The start of the second race was another good one with Mark inches from being called OCS at the pin end of the line. However it was Bruce’s green spinnaker that was the first to show on the run; Andy Christie’s was next with Mark in third. As the three round race developed, Mark was able to overtake Andy however he was unable to catch Bruce. The next four places were very keenly contested with little to separate Alastair Speare-Cole, Philip Russell, Hugh Doherty and Mike Toogood. 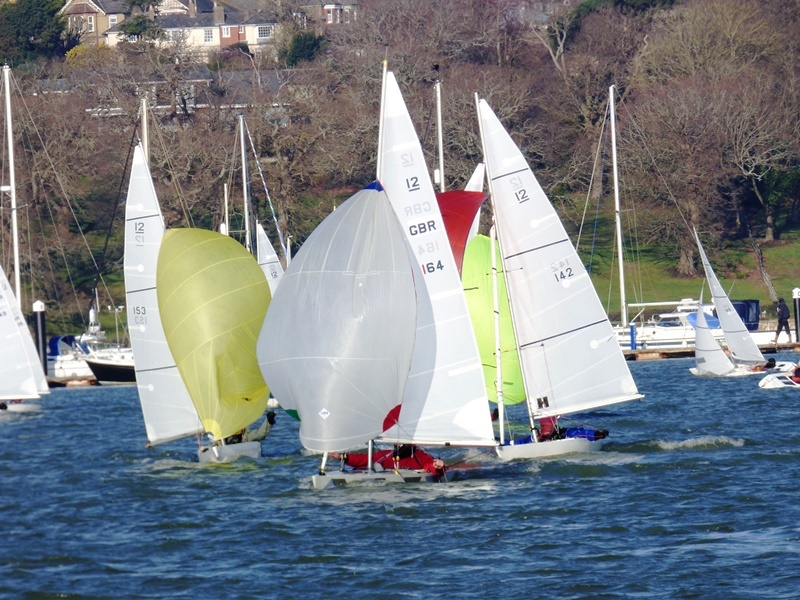 The third, and because of the chill-factor, final race of the day saw Mark initially stalled on the pin and round the windward marks in second behind Bruce. On the first run the fleet spread out left and right in the hopes of picking up the best breeze. On the second round it was neck and neck with Bruce and Mark swapping places however Mark got away in the third round and crossed the finish line well ahead. 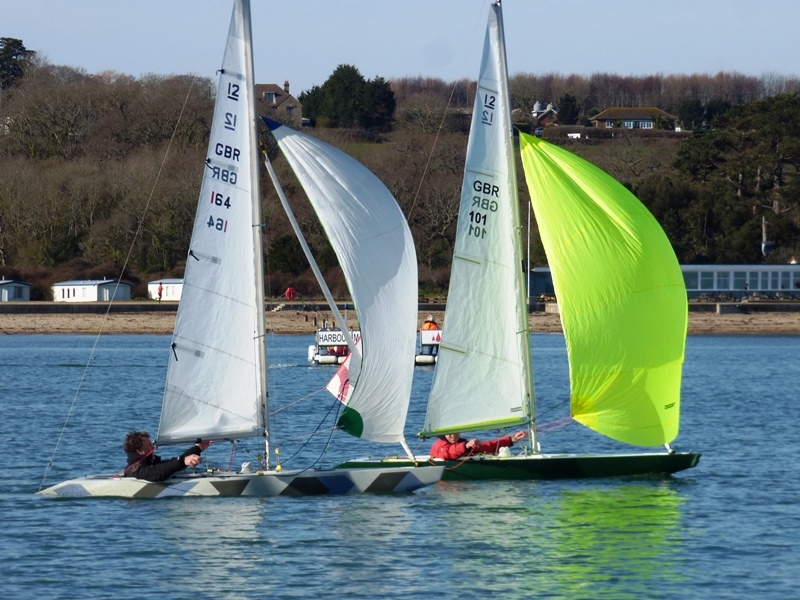 There was some very competitive racing mid-fleet with Hugh managing to come out ahead of Mike, Alastair, Jo Downer and Steve. 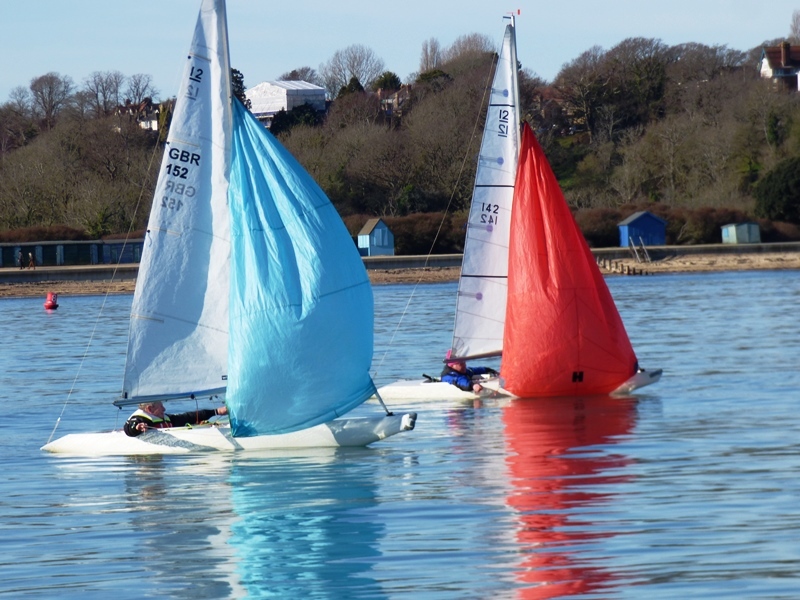 Sunday morning was sunny, a flat calm and cold with a bit of ice on the boats initially! 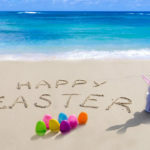 Although nothing to write home about the gentle breeze was from the SWest so the decision was made to race outside the harbour in the hopes that it would build as the morning went by. 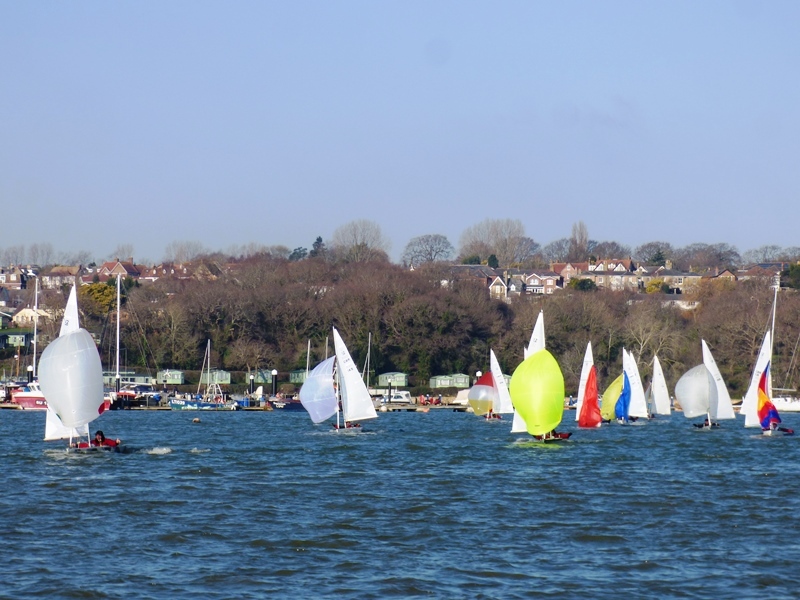 With the tide holding the Committee Boat in the wrong direction, the sun making it very difficult to see down the line and the anonometer registering less than 4 knots, the start line was set up (unusually) with Sea Breeze at the port end of the line! This inevitably caused a little bit of confusion and coupled with a slight misunderstanding between the two Race Officers, the first start saw the 1st Sub (General Recall) card played! In fact probably just as well as there was a 20 degree windshift so the course had to be re-set. The second start was better and although progress was slow, most did at least manage to keep forward momentum. Justin Biddle, who had not raced the day before led the fleet slowly back down the course with Mark Downer, David Russell-Jones, Bruce Huber and Bill Daniels (also absent from the previous day) trying to find the elusive zephyrs. 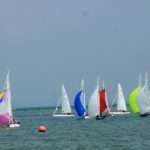 As it was clearly going to take over half an hour for a two round race, no one was heard to complain after it was stopped after just one round! Other than they got away first time, the second race was almost a carbon copy of the first. 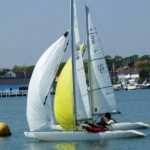 Justin again found the best of the breeze and led the fleet back down to the leeward gate with Mark, Alastair, Mike T & Bruce trying different routes in the hopes of finding the best breeze. 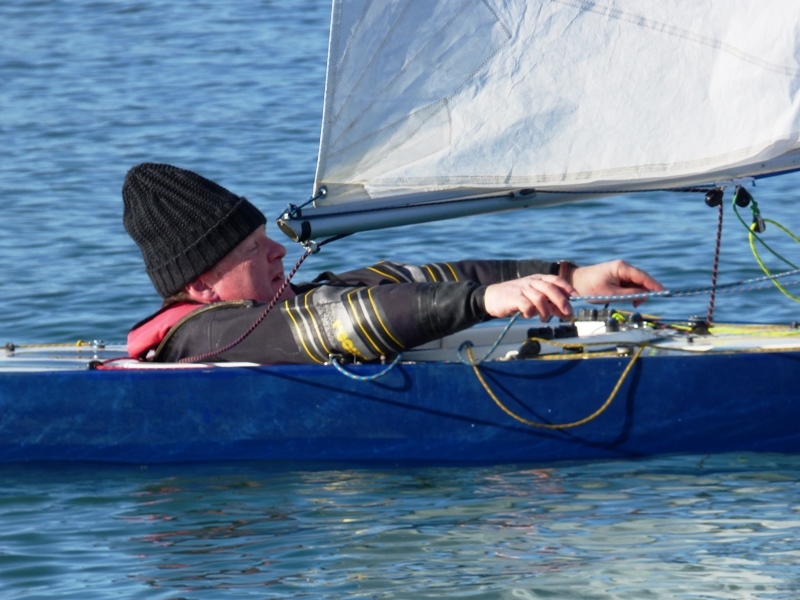 Despite (or perhaps it was a cunning plan) not having a spinnaker, well done to Owen Pay who came in tenth. 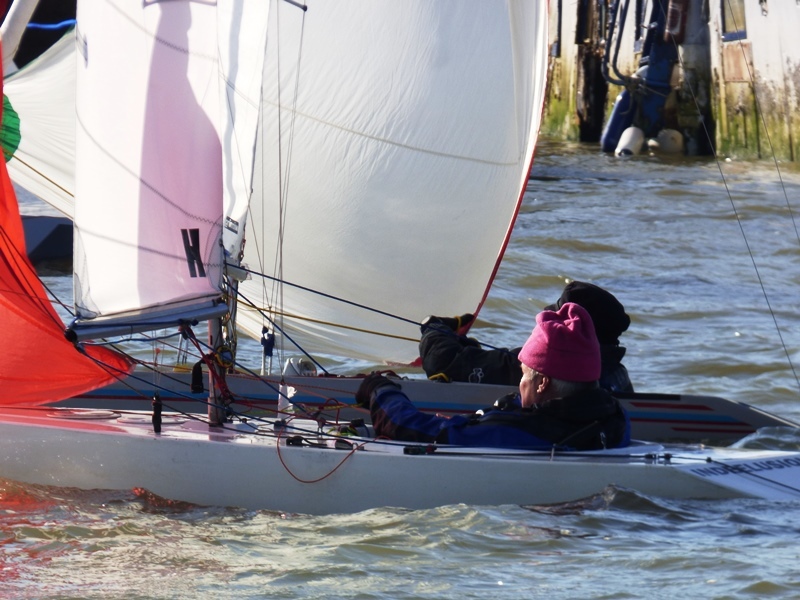 There was little between many of the mid-fleet boats; indeed Jo Downer and Steve W-S ended up tying for twelfth place. 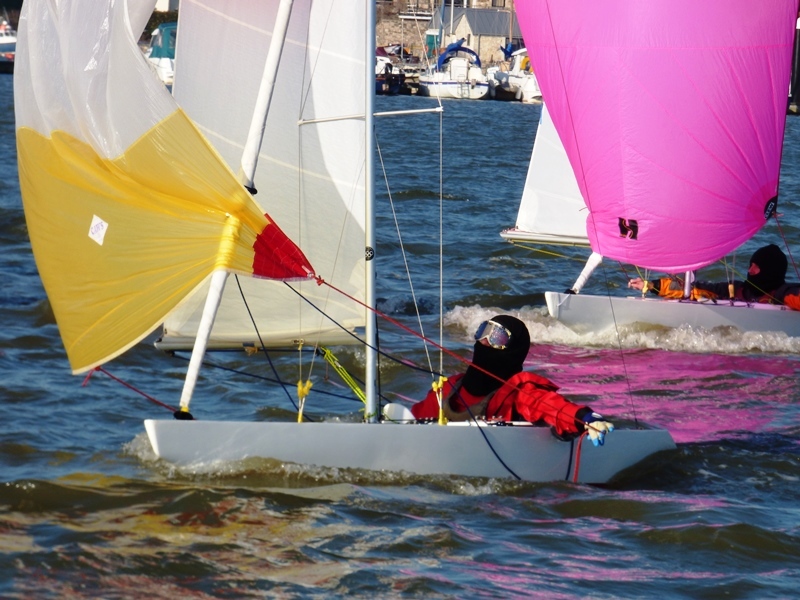 The breeze picked up to 10 knots for the third and final race. Three boats were OCS at the far end of the line but all came back. Alastair S-C, Bill Daniels, David Russell-Jones were to first to reach the windward spreader, but by the time they reached the leeward gate, Bruce & Mark had reeled them in; although it initially looked as if they were going to be nip & tuck for the rest of the two and a half round race, Bruce managed to get ahead and developed a convincing lead. David was third and Steve W-S was fourth. 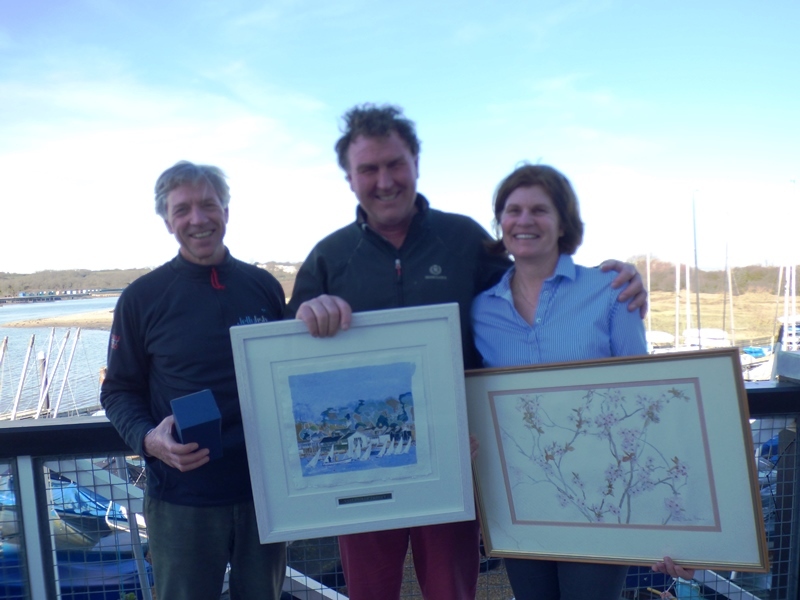 With two firsts and four seconds, Mark took home (for the fifth time in succession) the Valentine Trophy; Bruce was second and Mike Toogood was third. The Ladies Trophy was won by Jo. 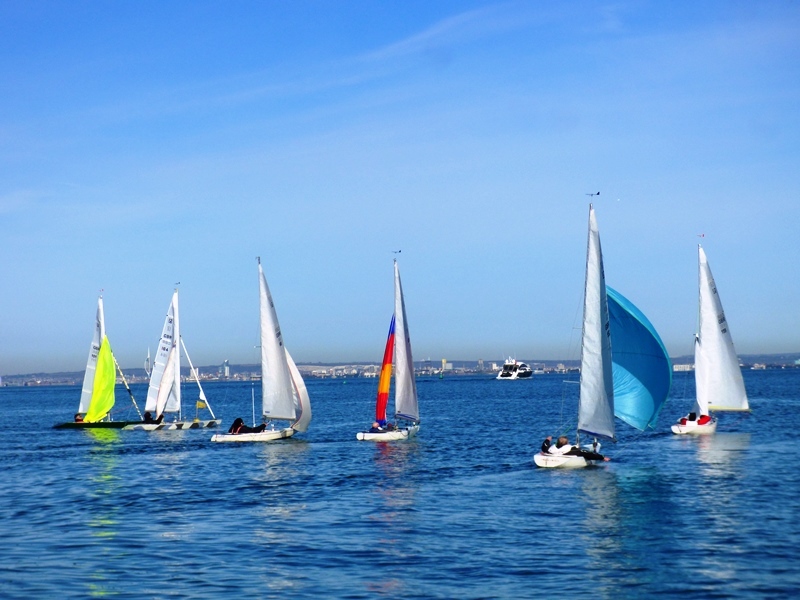 Next weekend is the annual Invitation Match Racing Championships – and with midday tides it should be fun!